22 Jan Children: Can they have a glass of wine? Can Children Have a Glass Of Wine at Dinner? Since the dawn of time, parents have been suppressing the desire to get their kids liquored up. Whether we’re talking about the teaspoon of brandy our grandparents were given as kids to warm them up on a cold day or the fifth of Jack Daniels we’d like to give our five-year-old to get him to sleep at night, the temptation is always there. But when we’re talking about something as simple as a glass of wine with dinner, is it really a problem? Kids like to mimic their parents, so if you drink wine at the table, there’s a good chance your kids are asking why they can’t have some too. If “Because I said so,” is getting old as a reply, you might want to delve into the question a little further and figure out for sure whether or not children can have a glass of wine with dinner and if not, why not. 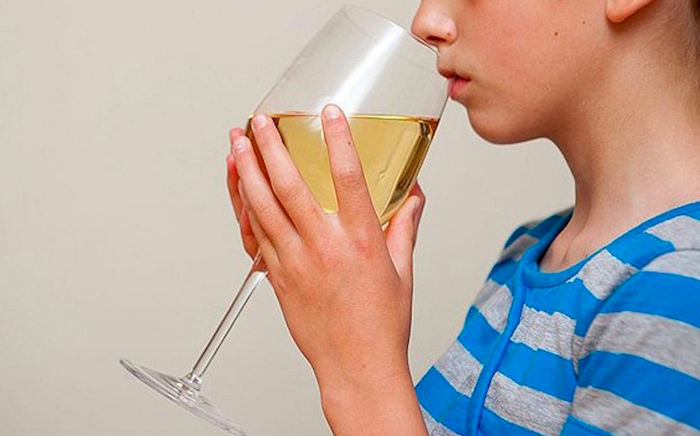 What are the health risks of giving children a glass of wine? Research shows, of course, that the opposite is true. According to research quoted in an article from British newspaper The Telegraph, people who drink at a young age are even more likely to become heavy drinkers when they are older. Shocking. What are the benefits of giving children a glass of wine? Well, for a parent, the benefit of giving a child a glass of wine is that it might move up their bedtime by an hour or so, but that’s probably not a good enough reason to do it. As mentioned, there is a school of thought that says that giving kids alcohol might remove the mystique and make them less likely to drink when they face peer pressure as a teenagers, but again there is actually evidence to support the opposite argument. There are a few general medical benefits to alcohol, and red wine specifically, although it’s not entirely clear how well these benefits apply to children. In case your child stays up late at night worrying that they may not have enough HDL cholesterol or that perhaps their body isn’t producing enough anti-thrombotic agents that might lower their chances of getting coronary heart disease, red wine can help with that. Alcohol is a natural blood thinner, so it may reduce the risk of stroke. Wine also contains antioxidants that can improve heart health and there is some evidence to support the idea that wine consumption can help to prevent Type 2 diabetes. All of this depends on how much wine is consumed, too, as once you start to drink too much you lose some health benefits and add some health risks. Is it legal to give your child a glass of wine? The legal drinking age in Greece is 18 while in many EU countries is above 19, but all that really means is that your child can’t wander into a bar or liquor store and buy a bottle or glass of alcohol. In some countries, there are special exclusions for things like religious use, medicinal purposes, and the parental exception. The parental exception is most relevant to the question of whether or not you can give wine to your child. This exception basically states that a parent can give their child alcohol as long as it is consumed completely in the parent’s presence. This leads to the uncomfortable situation when you have to tell Johnny to chug his beer at the restaurant because mommy really needs to use the bathroom. How many kids drink alcohol? According to a survey conducted by the American National Institute on Alcohol Abuse and Alcoholism (NIAAA), the average age at which children start using alcohol is 14. Even more disturbing, a 2005 survey shows that roughly 40% of eighth graders have consumed alcohol and 11% claim to have engaged in binge drinking. The truth of the matter is that the numbers are probably higher, since many who do it won’t admit to it. Children are going to discover alcohol someday and they will make a choice of whether to abstain, drink responsibly, or go for their own reality show. Parents who feel the need to rush that decision-making process by passing the bottle at the dinner table need to carefully consider the risks and rewards.